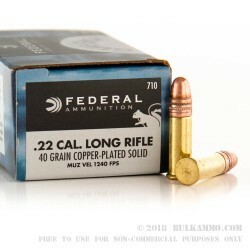 Trappers and hunters will love these .22 LR rounds for their dependable performance and proven results. 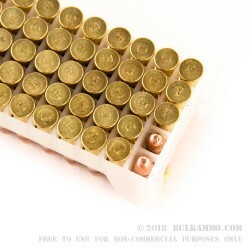 Federal manufactures this ammunition in-house using high-grade components and some of the finest equipment available. Their assembly processes are backed by almost a century of experience along with a hard-earned reputation for consistency with every shot. 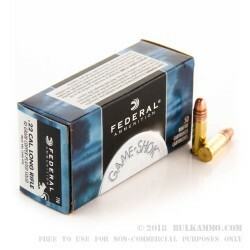 Federal's products are highly recognizable and have served law enforcement agencies, diehard hunters, and Olympic-level competitors for decades. Their Game-Shok line is intended as an affordable hunting offering that can be trusted to get the job done. 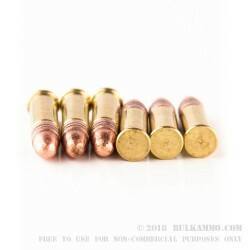 As such, these .22 Long Rifle loads utilize 40-grain copper-plated round nose (CPRN) bullets which have similar flight ballistics to a wide range of practice and hunting options for the caliber. CPRN projectiles feed reliably in a multitude of platforms and leave behind very little lead residue; this increases accuracy between cleanings and helps hunters pull tighter groups throughout a long day in the field. The CPRN is not designed for expansion and is intended to pass through a small game target with minimal hide damage. This effort maintains better integrity of rabbit and or raccoon furs that will be used for clothing or sold on the market. A: The advertised muzzle velocity of this product is 1240fps.